The 2014-15 Detroit Pistons season will be the team’s 74th overall and 67th in the NBA (National Basketball Association). The 2014-15 season also marks the franchise’s 58th in the Detroit suburban area. The team will be looking to improve on their 4th place finish in the Central Division and 11th overall in the Eastern Conference. The printable 2014-15 Detroit Pistons basketball schedule will be released soon and we will include it here for you. – 29-Jan @ Atlanta Game postponed due to severe weather conditions. 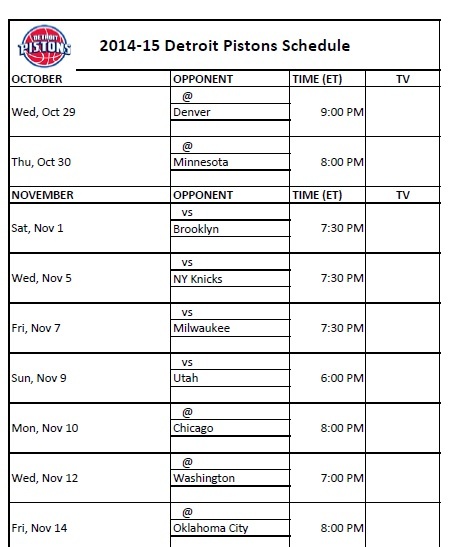 The following printable 2014-15 Detroit Pistons schedule is provided for those who would like to print out the team’s schedule for the 2014-15 NBA regular season basketball schedule is released.